Lesley Flanigan is a sound sculptor, composer, vocalist, and performer. 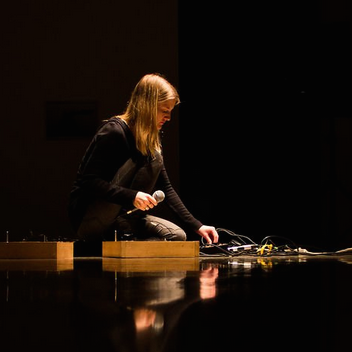 Her performances weave sound from her voice with hand-built feedback electronics. Her work with speaker feedback explores the physical acoustics of electronic sound by turning basic loudspeakers into musical instruments. In addition to her solo work, Lesley also performs as a member of Bioluminescence, a collaboration with Luke DuBois. Her performances have been presented in numerous venues, festivals, and art spaces internationally including the Guggenheim, Issue Project Room, Sonar, NIME, and Bent.